The Mixed Meal Tolerance Test (MMTT) requires a person to drink a "mixed meal," such as Boost or Ensure, that contains, protein, carbohydrates, and fat. The goal of the test is to measure how much insulin your pancreas can make in response to food. When a persons' body is working appropriately, the beverage causes blood sugar to rise, and as a result, the pancreas releases just enough insulin to normalize blood sugar. However, certain circumstances can cause the pancreas to work inefficiently—it may produce too much or too little insulin. To understand this process better during the MMTT, blood is drawn from an IV to measure beta cell reserve. Beta cells are the cells that produce insulin, therefore measuring their reserve is important in understanding insulin function. While the MMTT is most commonly used in persons with type 1 diabetes, it can be used for additional reasons. And although the MMTT has been referred to as the gold standard of beta cell reserve testing, it is seldom used in the clinical setting mainly because of its inconvenience—it can be time-consuming and invasive. Instead, the MMTT is used most often as a measurement tool in research settings, such as clinical research trials. If you have a very young child who has been diagnosed with type 1 diabetes and her physicians are trying to determine how much insulin she is still making. If you are a person who experiences low blood sugar, two-to-three hours after eating, a medical condition referred to as reactive hypoglycemia, and you do not have diabetes, your doctor may measure your glucose response to the meal and confirm if the body is releasing excess insulin in response to food. If you are a person who has undergone gastric bypass surgery and has had episodes of post-meal hypoglycemia. If you are a person with a suspected insulinoma that has recurrent episodes of hypoglycemia. If you are a person participating in a clinical trial, the MMTT can provide a more comprehensive physiological stimulus to insulin since the beta cells of the pancreas are responsive to certain amino acids and fatty acids in addition to glucose. For example, research trials may use MMTT tests in drug development, assessing the effectiveness of certain types of therapies, such as insulin pumps, glucagon-like peptide (GLP-1) agonists, and continuous glucose monitors. It is important that you have fasted for at least eight hours prior to the test. You should not drink or eat anything except water eight hours before the test begins. If you've ingested something accidentally, even something insignificant, such as candy or sugary gum, you must reschedule the test. Your medical team may tell you to limit strenuous exercise, alcohol, caffeine, and tobacco use the day before the test because these factors may influence insulin sensitivity. Plan to wear comfortable clothing. If your child is the one having the test, you may have her bring a special blanket or stuffed animal as a means of comfort. Upon arrival, you'll register and have your height and weight measured. Next, you'll be placed in a patient room where you will receive an intravenous (IV) catheter. The IV is used to draw the blood samples. Having the IV placed can be a little uncomfortable, especially for a young child so it's important to prepare them. Once the IV has been placed, you'll drink a liquid meal beverage, such as Boost. This beverage tastes similar to a milkshake and comes in a variety of flavors. Blood is drawn from the IV every 30 minutes over the course of two hours. While you are waiting, you may watch television, close your eyes, read or do whatever makes you comfortable. After you've completed the test, the results are sent to the lab. Typically the results take a few weeks to generate—you'll hear from your doctor when they arrive. You should not feel any side effects, except for some mild discomfort at the IV site. You may be wondering—is the MMTT the same as the Oral Glucose Tolerance Test (OGTT)? If you've had the OGTT in the past, you'll know that these tests are similar but not exactly the same. The OGTT is a good indicator of glucose tolerance and is used in conjunction with other tests, such as Fasting Blood Glucose (FBG) and Hemoglobin A1c to diagnose prediabetes, diabetes, and to screen for gestational diabetes. Similarly to the MMTT, you must take this test when fasting for at least eight hours. However, as opposed to drinking a mixed meal, during an OGTT a person is asked to ingest a glucose load only, equivalent to 75 grams of glucose (sugar) dissolved in water. The results of the OGTT can help clinicians determine, impaired fasting glucose (IFG) and impaired glucose intolerance (IGT). IFG and IGT cannot be diagnosed using the MMTT since the latter provides a non-standardized oral glucose challenge. The MMTT can assist in detecting the earliest stages of glucose intolerance, but it is not used to diagnose type 1 diabetes. Instead, in symptomatic patients, the American Diabetes Association recommends that blood glucose should be used to diagnose the acute onset of type 1 diabetes. In conjunction, a c-peptide test or autoantibodies test (both are blood tests) can confirm a diagnosis of type 1 diabetes. 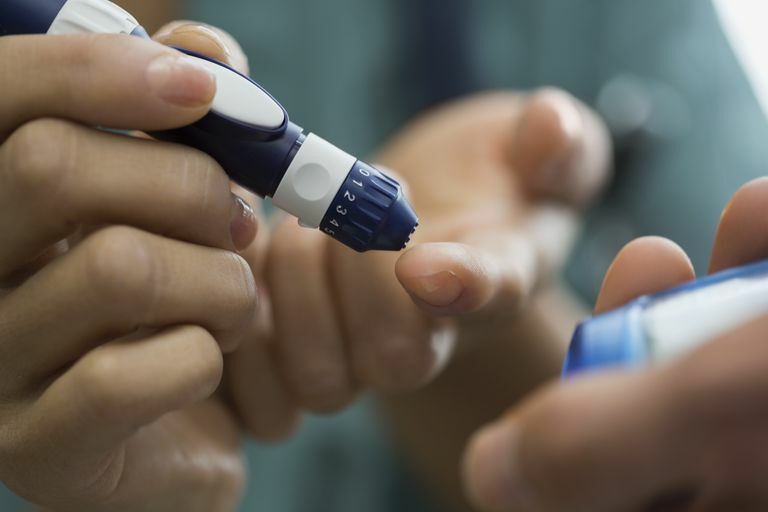 "[It] is now clear from studies of first-degree relatives of patients with type 1 diabetes that the persistent presence of two or more autoantibodies is an almost certain predictor of clinical hyperglycemia and diabetes. The rate of progression is dependent on the age at first detection of antibody, number of antibodies, antibody specificity, and antibody titer." Using autoantibodies to help determine diabetes risk can reduce the rate of diabetic ketoacidosis, assist researchers in designing prevention studies, potentially delay disease progression, and help people understand and better prepare for the disease. It's important to note that just because you have autoantibodies doesn't necessarily mean you have full-blown insulin-dependent type 1 diabetes; rather it may mean that the chances of you developing it are increased. If you'd like more information on the staging process you can access the American Diabetes Standards of Care. A Mixed Meal Tolerance Test requires a person to drink a beverage, such as Boost, while having blood drawn every 30 minutes for two hours. It is a great test to help determine a person's ability to make insulin, making it a very valuable measurement tool. But, the test can be inconvenient and difficult to perform due to its intensity and time commitment. Therefore, it used very infrequently in a clinical setting—such as your doctor's office. In some instances though, clinicians may use it to, for instance, test for reactive hypoglycemia. More specifically, if you are participating in a clinical trial, you may be asked to take one. If you do plan to take this test, don't worry. While the test may be time-consuming, it is not painful and does not cause any side effects. Remember, also, that this test is not used to diagnose any type of diabetes. And as always, if you suspect you or someone you love may have diabetes because of suspicious symptoms, such as increased thirst, increased urination, fatigue, excessive hunger, weight loss, etc. contact your healthcare team right away. Cincinnati Children's. Mixed meal tolerance test. ProSciento. Oral glucose tolerance test and mixed meal tolerance test fact sheet. How Do Doctors Diagnose Type 2 Diabetes, Anyway?